All in all, the Signstek FF-003 Portable Fish Finder with LCD Display is a great device to find fish in a time-saving and cost-effective manner. Users can take advantage of its colored LCD display to visualize the objects that are present below their boat, while the sonar sweeps through multi-level depth range to locate the best catch. Are you disappointed because you didn’t get enough catch for the day on your fishing excursion? Do you feel hopeless and just about to give up? Well, don’t conclude anything before trying the Signstek FF-003 Portable Fish Finder with LCD Display. This budget friendly fish finder is bound to deliver the best performance because of its standard quality components and versatile features. It is considered as an essential tool in locate the prey in just a couple of minutes without much effort. This phenomenal device enables the user to enjoy their fishing experience without investing much in a higher-end instrument. 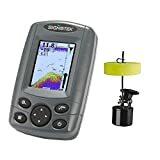 The Signstek Portable Fish Finder which features an LCD Display is like a dream come true for all individuals who are having a difficult time attracting fish towards their bait. It is designed to be used by professional as well as amateur fishermen. It helps them to locate some of the best fishing spots using sonar technology, when out in the sea. This model has the ability to track targets in all bodies of water, like lakes or ponds, rivers and even oceans. As soon as it is switched on, the Signstek FF-003 begins to automatically receive data. Therefore, only the sonar sensor is required to be casted from your fishing point and the device is all set to get you to your prey. Ever thought operating a fish finder can be this simple? The portable LCD Signstek FF-003 Fish Finder is reputed as one of the most affordable fish finders in its class. It offers outstanding value for the money, thanks to its versatile and user-friendly features. The 2.8-inch color display comes with a LED front light and is easily readable in sunlight as well as in times when the light is dim. Moreover, you can have a detailed view of desired spot on the screen clearly, be it the interpreted location and size of an object underwater, or the deepness of the water. The best thing is that users don’t need to have a technical background in order to know how to operate the device, it’s that simple. It is recommended to add this fish finder to your fisherman toolbox and conveniently work your way towards your prey with the help of sonar technology. It is to be noted that the sensitivity level is quite high on this gadget, so at times you may end up picking up vegetation and rocks from the water apart from fish.